- USB operated, DC 5V power supply. - RGB SMD5050 leds Chips, PU glue waterproof. - 4 Pcs RGB LED light strips. - 3 pcs 4 inches connectors and 1 piece 23.5 inches USB cable. - 1 piece 24 keys IR remote control. Adjustable light: 16 RGB colors change lights and 4 dynamic modes, 10 dimmable. Energy Saving: Save up to 85% energy, 50000hrs. Please clean the back of TV before install the TV backlight, and don't fold or wrap the LED light strip. Keep the lights strip arrows "→"in the same direction, "+5V" connected with +5V. Make sure the IR sensor is not be blocked,connect the LED strips with the USB cable in the TV USB ports. Remove the insulation spacer from remote control, push the "ON", the led strip white light will light on. Pls test the light performance before hooking up, connect LED strips and plug USB cable into TV USB port, keep tv LED strips lighted on for about 5 mins without any flicker. How to solve the following issues you may meet? 1.The light can't be turn on/off by remote. - As the remote is IR control, please adjust the signal receiver postion, keep the remote close to tv edge to make sure the remote controller works. 2.The light flicker When plugged in. - It caused because the TV USB port can not supply enough power, please use a USB wall charger to light up the light strips. - It happen that the four lights strip are not connected properly. Make sure the lights strip and connector "+5V R G B" should connected to "+5V R G B" properly before Plugged in. 3. The light still a little filcker when tv is off. - The TV USB port still supply power current after tv off, please use tv lights remote to turn the backlight strip off. ADJUSTABLE LED LIGHTING: TV lights with remote provide 16 static RGB colors, 4 dynamic modes(flash, fade, strobe and smooth) 10 level brightness adjusting. It's nice to change the light color behind tv to match the mood and makes movie watching or play game so much more enjoyable. REDUCE EYES STRAIN: LED light strip for tv increases perceived image clarity, comfortable bias lighting will reduce eye fatigue and it gives your tv a nice glowing effects at night and walk in the without tripping over things between the bright tv and dark room. LED STRIP APPLICATIONS: 2* 28.3'' + 2*50'' back lighting mainly used for 65 70 inch TV decoration, colorful tv led backlight add a special touch to your media room & make your home like theater. Just point the remote towards the recevier postion to get the best signal, amazing ambience lighting will lights up to surroundings. 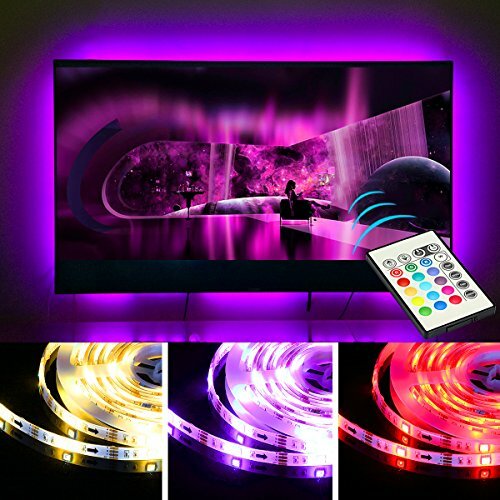 EASY TO INSTALL: 3M adhesive tape is extremely good and durable, sticky work well and hold nicely on your tv without come off, wonderful backlights will make your TV or Computer screen more nice and vibrant.TV light strip powers on/off with your TV. SAFETY USE WARRANTY: TV led strip powered by USB, DC 5V with PU glue waterproof, low energy, safety for children to enjoy the funny time with tv lights.1 year warranty. Please contact us to get replacement support for any problem of tv lights. If you have any questions about this product by FRONTEC, contact us by completing and submitting the form below. If you are looking for a specif part number, please include it with your message.